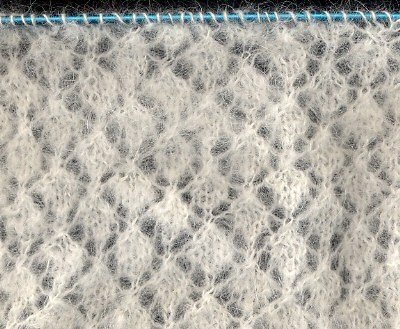 Leigh's Fiber Journal: Lace Knitting Success------NOT! After knitting about 12 inches or so on my handspun Samoyed lace scarf, I was hoping to be able to report that I was finally getting the hang of it. Unfortunately, I can't. I suppose that I can honestly say that I'm beginning to understand the pattern and see how the rows fit together. I have it somewhat memorized and mostly know what to do next. I only have to look at the instructions to see how the row starts off. After that I can knit with no problem. Well, I take that back. I do have some problems. I'm still making occasional silly mistakes. I'd call them concentration mistakes because they usually occur when my mind has journeyed elsewhere. Somehow I end up at the end of a row and realize that the pattern is no longer working. But! At least I'm catching them before I have a real disaster on my hands. Row 1 - *k1, yo, k2tog, k1, k2tog, yo* Repeat to last stitch, k1. Of course this is the Americanized version. The UK version refers to yarn overs as yarn forwards. The place I usually mess up is the knit-3-togethers. I tend to somehow drop one of the 3 stitches. 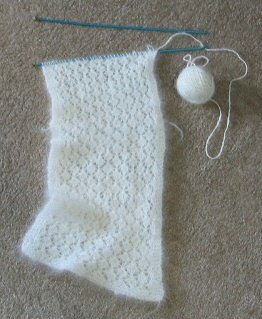 I am knitting on US5 needles and I do tend to knit tightly which doesn't help, I know. At one time I thought I would never be interested in knitting lace. In fact I vowed I'd never do it. I didn't think I had the patience. I lean towards yarns that spin and knit quickly. Hence I am always in awe of spinners of fine yarns and knitters of lace. I've been enjoying this project however, in spite of all the frogging I've had to do. I'd like to think that I'm becoming a more patient person, but I doubt it. More likely I'm just finally becoming interested in the challenges of knitting lace. And this yarn just begged to be knit this way. Progress, I think, will be very slow. I will continue to put the project down when it frustrates me, and pick it up again at a later date, when time has worked it's soothing magic on me. It's just nice to report that at least some progress is being made. Wow. The Lap Lady things you are VERY talented. She's really jealous. She likes to sew & knit and all of that but she doesn't have any skills compared to you. This is just BEAUTIFUL! Hi. Well I know nothing about knitting, but my late grandmother loved to knit all kinds of stuff for us when we were little. And my father is a sheep farmer. He farms a Merino type sheep called Letelle. It produces superfine high quality wool. You might have to look around a little (also llok on page 5) but there are several pictures I think you will like. Your scarf is lovely and I can see how soft it is. Keep plugging away. It will certainly be worth the effort. our Lady thinks that's lovely and wishes she could do that. are you worried that cats are now stalking your yarn site? Gosh what a beautiful pattern that is and that yarn looks like it's absolutely dreamy to knit with. Beautiful work ... and I love the yarn. I had two Samoyeds but that was before I was doing any substantial amount of lace knitting, although I had dreams of using their wonderful coat for knitting. The halo it produces is delightful. Keep on keeping on! You'll be surprised how much easier it gets (and if you're having trouble with charts, write out the directions in short lines, sort of like a verse in a poem, and you may find lace knitting a whole lot easier!). That is absolutely beautiful yarn Leigh! It is knitting up just gorgeous. Even if it does take awhile to complete, that scarf will be worth it. Thanks for commenting on my blog. Hi Leigh, I just discovered your blog and love it. I, too discovered the frustrations of lace knitting and found the best way to ensure I don't mess up so often was to mark each pattern repeat with a stitch marker. I immediately knew/could find my mistake and correct it! Keep plugging away at it as it really is a beautiful scarf! Debirah, thank you so much for visiting and taking the time to leave a comment. I really appreciate the tip too. I think it will help me quite a bit. Thank You for the lovely comment you left - on my blog. I knit and spin more than I blog! Anyway, the secret to Lace knitting, is a Lifeline, every two rows. I just had to make it part of the process, like K1, YO, K2tog, Purl the next row, Lifeline. No more frustration, you can see your work grow, drop a stitch it's on the Lifeline just waiting for you! I too, belong to Online Guild of Weavers, Spinners, and Dyers, but how do you get your blog added to their site?? Thank you for the helpful information Anita!I think a lifeline would be a life saver for me and my lace knitting. I'm enjoying everything! Thank you for all your extraordinary gifts.